Interested speakers need to apply by December 19, 2008 by completing the conference’s application form. The organizers note that “We’re not necessarily looking for vast public speaking or punditry experience — we just want people who are experienced and passionate about social media and blogging.” Tickets for the conference have not yet gone on sale, but as per previous years the Conference will be affordable, fun and family-friendly. Lumby, BC – The JW Inglis Elementary School Parent Advisory Committee and Starlit Citadel, an online board games store are working together to hold a fundraising evening of board games on Wednesday, December 3, 2008 at JW Inglis Elementary School. “Introducing board games to children encourages critical thinking and math skills at an early age. Furthermore, it is an environment that emphasizes interaction and competition which an entire family can participate in,” said CEO Tao Wong of Starlit Citadel. Video Games Live today announced 10 Canadian performance dates for 2009. VGL, along with the Vancouver Symphony played to a sold-out audience at Vancouver’s Orpheum Theatre in October and I can say first hand that this show is well worth the ticket price. Not only is VGL a great journey down gaming’s nostalgia lane, it’s a fun and entertaining way to introduce our children to the world of symphonic music. While there has been no Vancouver date yet announced for 2009, I am hopeful that the show will return here next year. Canadian shows sponsored in part by Future Shop. Vancouver – The BC Innovation Council (BCIC) is sponsoring the 12th Canadian Financing Forum, featuring 30 presenting companies and Western Canada’s best investor audience. The forum will take place on January 29, 2009 at the Hyatt Regency Hotel in Vancouver with a focus on Information Technology and Cleantech & Advanced Technology. Up to 30 Companies will present at the Canadian Financing Forum. Past presenters have raised over $1 Billion and 45% of the Presenting Companies attending the Financing Forum have successfully raised funds over the last 8 years (2001-2008). Meet investors from Canada’s most active venture funds and US investors that invest in Canadian companies. Establish and maintain the relationships you need for the future. The Canadian Financing Forum matches North American Corporate and VC investors with serious entrepreneurs looking to build world-class technology companies. The Forum is one of the most respected resources for North American investors who seek to recognize, gain exposure to, and facilitate partnerships with the best and most promising Technology entrepreneurs and companies that are based in Canada. Confirmed investors who will be present at the Forum thus far include: Blackberry Partners Fund, BC Advantage Fund, BDC Venture Capital Group, Cascadia Capital LLC, Celtic House Venture Partners, Yaletown Venture Partners, RBC Capital Partners and more. Those companies who are interested in presenting at the Forum need to apply in advance; all applications will be considered as they are received. Toronto – Corus Entertainment’s Nelvana will now offer its animated content on demand in the U.S., U.K., France and French-speaking Europe through Tribal Nova’s KidStudio online environment. Nelvana programs like 6teen, Tales from the Cryptkeeper and Di-Gata Defenders will be available depending upon the territory. KidStudio is Tribal Nova’s movie studio-themed entertainment world featuring leading children’s brands targeted at a six- to twelve year-old audience. Offering games, online comic books, full-length episodes of favourite children’s shows and personalization features, it is a secure, immersive environment with kid-friendly navigation and instruction features. KidStudio will be available on www.kidstudio.com and through several major games portals in all these territories. “Our partnership with Tribal Nova is an important initiative in our international growth strategy for expanding our content to our audiences on the Internet,” said Peter Maule, Vice President of Home Entertainment and Digital Media, Nelvana Enterprises. “We’re delighted to be working with Nelvana to feature its quality animated programs on our kid-friendly, secure immersive social networking virtual world KidStudio,” said Pierre Le Lann, Co-CEO of Tribal Nova. London, Ontario – Big Blue Bubble is proud to present “Home Sweet Home: Christmas Edition”! Christmas spirit has faded away in the town of Good Tidings. It’s up to you and your expert team of builders to help them out! 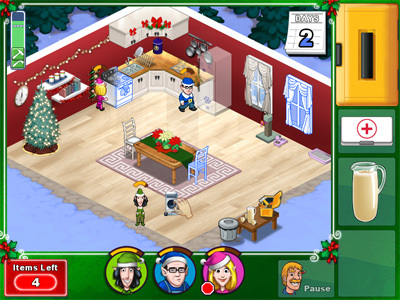 Make your clients happy by solving their riddle based requests and designing their dream room! You can design rooms in an infinite number of ways because you pick the type of furniture, its color, style, and where it goes. It’s going to take all of your New Tools and New Furniture to bring Style and Christmas Cheer to the Living Rooms, Offices, Basements, Kitchens, and Bathrooms of the townspeople. The remarkably easy and intuitive drag and drop system and helpful tutorials will allow you jump right into designing rooms and making your clients happy. Santa needs you – so get designing! Toronto – Ontario is strengthening its economy with a $3.3 million investment in its cultural media industries. Sixteen initiatives received support through the province’s Entertainment and Creative Cluster Partnerships Fund. The fund was designed to help Ontario’s entertainment and creative industries grow and increase their competitive advantage in the global marketplace. The industries include commercial theatre, film and television production, interactive digital media, music recording, magazine and book publishing. “Ontario’s cultural industries are a vital contributor to economic growth and prosperity in this province. This investment will help our cultural industries seize the economic opportunities before them and increase their competitive advantage in the global marketplace,” says Ontario’s Culture Minister Aileen Carroll. The Entertainment and Creative Cluster Partnerships Fund is a three-year $7.5 million fund that was launched in September 2006 to stimulate growth in Ontario’s entertainment and creative industries by promoting capacity building, marketing, innovation and skills development. OMDC Chair, Kevin Shea said that “Since its inception, the Entertainment and Creative Cluster Partnerships Fund has provided support to 43 projects involving 285 partners with combined budgets of $15.9 million dollars, and the OMDC is proud to co-administer a fund that encourages innovation and fosters new business partnerships that encourage growth across Ontario’s cultural media industries and academic institutions.” The Ontario Media Development Corporation (OMDC) is an agency of the Ontario Ministry of Culture that facilitates economic development opportunities for Ontario’s cultural media industries including book publishing, film and television, interactive digital media, magazine publishing, and music industries. Women in Games International (WIGI) presents their WIGI Celebrity Ebay Auction, a collection of over a hundred video games and game-related merchandise items — much of it signed by industry leaders — being auctioned to raise funds for Women in Games International. If there’s one thing gamers love more than games themselves, it’s awesome game-related merchandise. That’s why Women in Games International is happy to announce their 2008 celebrity auction, a collection of over 100 items generously donated by leaders in the video game industry — including Bungie, Microsoft Game Studios, Electronic Arts, and many other game companies. Montreal – Kovasys Inc., an IT recruitment agency in Montreal, has recently been witnessing a spike in the number of American companies crossing the border into Canada – especially Montreal- to do their software development and high tech projects. Due to the unstable economy in the US, and massive layoffs, more and more companies are deciding to save money and hire developers by nearshoring their IT operations to a cheaper yet proximate location with a stable economy. Montreal meets this criteria as it is only few hours away from Chicago, New York, and Boston, yet operating costs are up to 55-70% lower due to exchange rate and subsidies for IT companies. Morgan Stanley, a global financial services provider from New York City, has recently settled their offices in the old district of Montreal and is in the process of hiring 700 developers. Other major companies such as SAP, Ericsson, and PC Mall, have also made Montreal their second home. Mississauga – Christmas shoppers looking for something different this year could be forgiven for thinking that the only new board games available these days are yet more “-opoly” variations. But this year, a Canadian game inventor is out to change that. 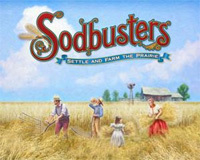 His unique new game, “Sodbusters”, allows players to relive the adventure of settling and farming the prairie, and is now available in Peavey Mart and selected True Value stores throughout Western Canada.